Frank Moses (Bruce Willis – Die Hard), the retired CIA Operative, is adjusting to civilian life with his girlfriend Sarah Ross (Mary Louise Parker – Weeds). She yearns for more adventure and excitement and gets just what she wanted when Frank’s friend Marvin (John Malkovich – In The Line Of Fire) alerts him that there’s a missing portable nuclear device linked to a former asset of his named Dr. Bailey (Anthony Hopkins – The Wolfman). So Frank reluctantly takes on the mission and regroups with his former allies to avert a nuclear crisis. 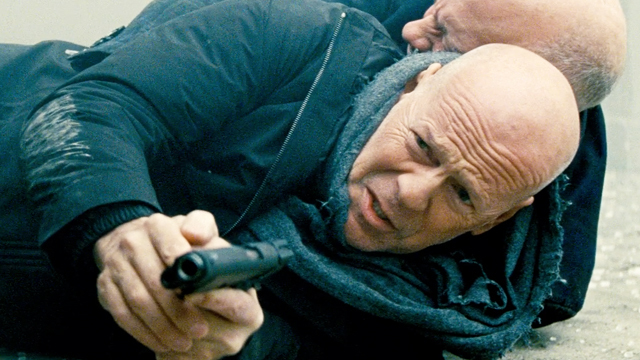 Red (which stands for retired and extremely dangerous) was one of the best action films of 2010. It utilized some amazing set-pieces and had a witty, adventurous script that always kept you on your toes. Thankfully Red 2 is equal to the task and a lot of fun to watch too. With crucial new cast additions and some amazing set-pieces (including great sequences in London and Paris), it’s an action comedy that leaves a broad smile on your face. Bruce Willis has been hit and miss recently. It’s sad to think that his most accomplished roles recently were his cameos in The Expendables 1 & 2. 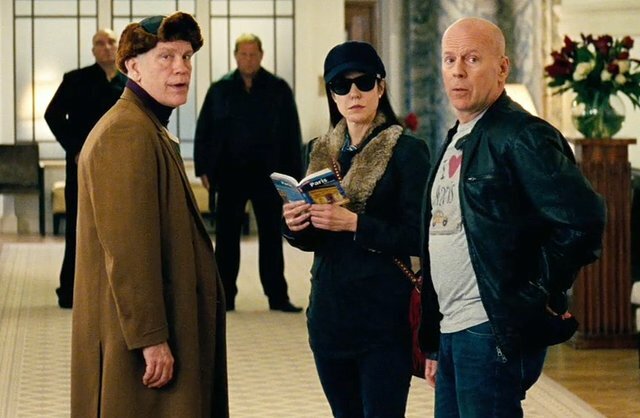 We certainly won’t be seeing him in a third Expendables after his pay-dispute and Die Hard 5 was awful so it’s nice to see that Red 2 finds Willis in brilliant comedic form yet again. Willis is excellent and more than handles the action quota too. He clearly enjoyed revisiting the character of Frank Moses and noticeably has fun with it. Mary Louise Parker plays the formerly shy but adventure-yearning Sarah Ross to near perfection and her natural chemistry with Willis makes the film’s romance work very well too. She’s given a good run for her money when it comes to Franks affections too. Catherine Zeta-Jones plays femme fatale Katja exceptionally well with the three creating an amusing dynamic. John Malkovich rolls back the clock yet again as Marvin and looks the part as an action superstar. But perhaps the film’s best piece of casting lies with Dame Helen Mirren who yet again steals the show as former British Intelligence assassin Victoria. She is amazing in the film and shares a really good dynamic with Brian Cox as a hilarious former Russian superspy Ivan Simanov. GI Joe regular Byung-hun Lee is finally given a Western movie action role to properly showcase what an amazing talent he is. The Joe films certainly stamp his credentials as a martial artist but Red 2 gives him a good platform to hopefully build a solid Hollywood career from. He easily possesses the charisma to take on the action mantle after the likes of Stallone and Willis hang up their holsters for good. With a cast full of vibrancy and panache, Red 2 defies the odds and proves that the first Red wasn’t a fluke. It finds Bruce Willis back on his best form and using John Malkovich and Helen Mirren again proves to be a winning masterstroke. I really hope we get a second sequel to this; it’s rare for a modern action film to work so well and this ensemble deserve to take another ride together.